T4 is the sometimes touching, sometimes horrifying story of Paula. Paula’s mother was exposed to rubella (German measles) when she was pregnant with Paula, which resulted in Paula being born almost deaf. Although she does not remember it, her mother told Paula she was still able to hear some sounds as an infant and toddler, because she clapped when her mother spoke, loved birdsongs and the cuckoo clock. After an extremely high fever at the age of sixteen months however, Paula was left completely deaf. Paula is often frustrated by her inability to access a common language with her family and neighbors. She develops her own complicated system of hand signals and gestures within their small community which allows her to communicate more effectively. That my life was good. Paula is thirteen years old in 1939. Hitler has led Germany into World War II and he has instituted his plans for a “master race” through Action T4 which called for the elimination of any person who did fit into his definition whether that be race, color, mental or physical disability. Were superior to other people. To become an “Aryan” race. Fearful that the Nazis will discover her, Paula’s parents give her into the custody of Father Josef, a family friend and Catholic priest who will find a safe place to hide her. Paula is moved several times to different locations, hiding from the Nazis, always fearful of being discovered. In 1941 when the Germans were preoccupied with fighting with the Russian Army, T4 was repealed, but the killings did not stop. It wasn’t until the American soldiers occupied Germany that it was safe for Paula to return to her home. Had survived the worst, but we also felt guilty. Important had died–would never subside. 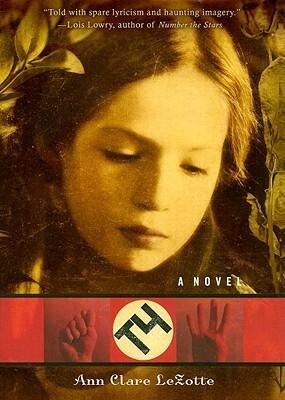 LeZotte’s choice to tell Paula’s story in free verse has the effect of shining the brightest light on both the bold horror into which the German people were thrown and the refusal of many to divest themselves of their compassion and humanity. LeZotte’s final reminder to the reader following Paula’s story is to remember. It is only by remembering the crimes and cruelty of the Nazi regime that we ensure it never happens again. T4 is a quick read as a resource for classroom units or as a read-aloud at home that springboards important discussions on tolerance and acceptance of differences. NOTE: The only heads-up I would offer to adults planning to use this is that LeZotte does, at one point in Paula’s journey of hiding, have her reflecting on the physical changes in her body. Because there is only a single mention, the topic doesn’t have any import on any other part of the story and is–in my opinion–superfluous. It is only a couple of lines, and are easily skipped in a read-aloud in a classroom, but it is there–in case you have a young reader using it as an independent reading choice and want to discuss this with him or her.